Article 37(c), Convention on the Rights of the Child. The inherent rights of a child to protection and safety are something no child, regardless of race, creed or nationality, should be deprived of. Palestinian children living in the Palestinian territories are at a disadvantage from day one given that they must live under a military occupation, which in itself is a violation of basic human rights. These are the words of MIFTAH writer Joharah Baker. Sentiments echoed by millions around the world irrespective of race, colour or creed… Apart from the apartheid state Israel. 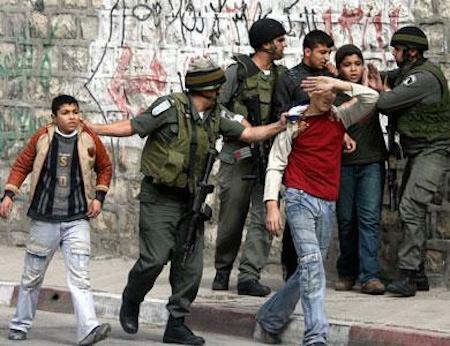 Palestinian children being harassed by Israeli soldiers. At a time when West Bankers have been permanent targets of Israeli terror acts, home raids and abduction campaigns, scores of Palestinian children have been kidnapped in the early months of 2014, corroborated by dozens of videotaped sworn affidavits, the EMHRN said in a report on the Israeli violations of Palestinian children’s rights. 75% of the incarcerated minors have been subjected to physical torture while 25% are brought before Israeli military courts, the report pointed out. Israeli occupation troops stormed more than 1500 Palestinian homes and shops over the past three weeks and kidnapped more than 600 Palestinians, including children below the age of 18. According to the Euro-Mid Legal Counsel Ihsan Adel, the Israeli police and army have been launching overnight raids on Palestinian homes and capturing Palestinian minors without updating their families about the charges. Countless cases of random kidnaps, torture testimonies, and violations of the convention of Children’s Rights, signed by Israel in 1991, featured in the report. Article 9 of the Universal Declaration of Human Rights to which Israel is a signatory, states that, “No one shall be subject to arbitrary arrest, detention or exile”. However, several Palestinian children have been picked up by Israeli military forces in the West Bank off the streets, from their homes or at one of the 600 checkpoints throughout the Palestinian territories. The Euro-Mid kept record of numerous occasions during which Palestinian minors have been kidnapped in Israeli overnight home-raids, generating a state of unparalleled anxiety and panic among the children and their families with no legitimate reasons. 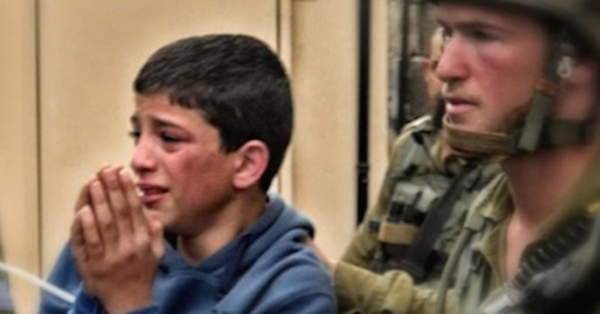 Blowing up Palestinians’ home gates, snatching a child from his/her own bed, resorting to psycho-physical torture, and locking minors up in solitary cells, have all been Israeli terror tactics to agonize Palestinian children, both in the interrogation and pre-interrogation phases. The Israeli occupation authorities have not only been incarcerating Palestinian children in solitary cells that often cover a very narrow area but also denying them their right and need to be visited by their lawyers and parents, even during the court hearings. It is almost impossible for the child to stand against the dark-gray-colored cell walls, covered with protrusions from all sides. Each year approximately 700 Palestinian children aged 12 to 17, the great majority of them boys, are arrested, interrogated and detained by Israeli army. “Neither the spontaneity of childhood nor children’s right to live in safety seem to really matter for the Israeli occupation,” the report concluded, calling on the international and human rights institutions to immediately step in so as to halt such unspeakable Israeli violations of Palestinian children’s rights. “No human being shall ever turn blind eyes and deaf ears to any such kidnaps or tortures against children,” researcher in the Department of Political Science, Sandra Owen, said, as she raised alarm bells over the 1406 Palestinian children killed since 2000, including 263 below the age of 8 and 450 below 15. “Ill-treatment of Palestinian children in the Israeli military detention system appears to be widespread, systematic and institutionalized,” according to a briefing paper prepared by the agency. 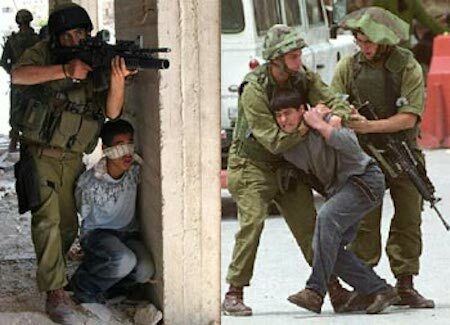 According to figures cited in Children in Israeli military detention: observations and recommendations, approximately 700 Palestinian children each year between the ages of 12 and 17 are arrested, interrogated and detained by Israeli army, police and security agents. In the past 10 years, some 7,000 children – the majority of them boys – were held, an average of two children each day. The report also noted some improvements already made, such as raising the age of adulthood for Palestinian children from 16 to 18. After the interrogation children are generally brought before a military court for a hearing. Children enter the courtroom in leg chains and shackles, wearing prison uniforms. Most children see their lawyers for the first time when they are brought to the court. Not all lawyers have easy access to the applicable military orders as they are not always made available in Arabic, as is required under international law. In most cases bail is denied. This directly contravenes article 37(b) of the Convention on the Rights of the Child. In the majority of cases, the principal evidence against the child is the child’s own confession, in most cases extracted under duress during the interrogation. Ultimately, almost all children plead guilty in order to reduce the length of their pretrial detention. Pleading guilty is the quickest way to be released. In short, the system does not allow children to defend themselves. Two of the three prisons run by the Israel Prison Service, where the majority of Palestinian children serve their sentences, are located inside Israel. These practices are in violation of international law that protects all children against ill-treatment when in contact with law enforcement, military and judicial institutions. Yet Israel continues their torture while the silence of those in power in the Arab world and other states speaks volumes.